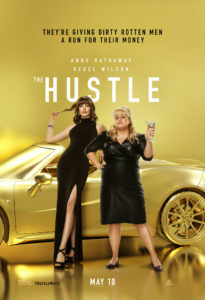 “The Hustle” stars Anne Hathaway, Rebel Wilson, and Tony Award winner Alex Sharp in the third version of the story of competing con artists on the Rivera. The first one was “Bedtime Story,” starring Marlon Brando and David Niven. The remake was the classic “Dirty Rotten Scoundrels” with Steve Martin and Michael Caine, featured in my book 101 Must-See Movie Moments. It became a Broadway musical. And now, yet another gender switch — this time it is two con women, Hathaway and Wilson.